The data suggest they have a tough road ahead. While single copy sales of the New Republic (considered the most objective measure of a magazine’s print appeal) more than doubled from the fourth quarter of 2012 to the first half of 2013, following Facebook founder Chris Hughes’ purchase of the magazine, they have steadily declined since. Between the first and second halves of 2013, newsstand sales fell by 57%, and fell a further 20% in the first half of 2014, according to the Alliance for Audited Media. The New Republic’s troubles are reflected in the data for its fellow niche news magazines, which all target an elite audience consisting of older, educated and wealthier readers. Looking at three comparable magazines (The Atlantic, The New Yorker and The Economist), the digital side of the business has been making some gains, but single copy sales for this group were down or flat since 2008, according to the Alliance for Audited Media. For the first half of 2014, The Atlantic saw its sales rise 20% from a year before. The New Yorker, however, fell 5% during the same period, while The Economist fell 16%. For these niche magazines, the number of print ad pages has also fallen year-over-year from 2008 to 2013 (the most recent data available to the Pew Research Center), according to the Association of Magazine Media (MPA). The group has lost 36% of its ad pages between 2008 and 2013, with The Economist showing the greatest decline at 41%. On the digital side, The Atlantic and The Economist fared the best in terms of growing their audiences in recent years, according to comScore data provided by the MPA. 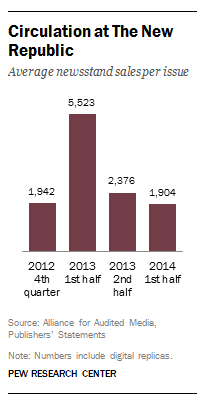 Both publications posted gains in their web traffic between the third quarters of 2013 and 2014. The New Yorker, however, saw its traffic decline slightly, falling from 3.3 million unique visitors to 3.1 million. All of these magazines’ websites outpace the New Republic’s traffic. Publicly available comScore figures indicate the magazine’s website had 1.5 million unique visitors in January 2014, according to Ad Age, and a million in April, according to Digiday. Indeed, these niche news magazines attract much smaller audiences compared with other, mass-audience news organizations. 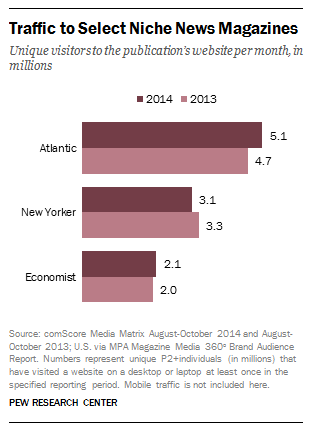 By comparison, Time.com had 10.3 million monthly unique visitors in the third quarter of 2014 (according to the MPA), while the most widely visited print news publication site in the U.S., The New York Times, had 41.6 million uniques. Katerina Eva Matsa is an associate director of journalism research at Pew Research Center. Michael Barthel is a research associate focusing on journalism research at Pew Research Center.